Creating custom ringtones and assigning to different contacts is always a fun. However, if you have iPhone, then iTunes charges at least 99 cents to provide your favorite ringtones. Even if you have numerous songs in your music library, you have to pay greatly to make ringtones of them. If you wish to make any part of the song your iPhone ringtone without iTunes, then choose these top four iPhone Ringtone Converters. Let us now have a look at these top four iPhone Ringtone Converters that will turn any piece of audio for making a customized ringtone. iMyFone TunesMate iPhone Manager helps in freely transferring the media files between the iPhone and computer/iTunes and managing iPhone data the way you wish to be. Almost all media files are support, such as music, movies, audiobooks, podcasts, playlists, photos, ringtones and much more. It provides one-stop solutions to make and download ringtones to your iPhone very simply. Support to make ringtones from various formats like MP3, WAV, M4A, WMA, AAC, etc. Decide the precious part of a song to be the ringtone without quality loss. Create tones from any songs on computer or in iPhone and save the tones directly to your iPhone. “Fade in and Fade out” feature to make tones sound smoothly. Step 1: Connect the iPhone to the PC and locate TunesMate. Step 2: Go to “Music > Ringtones > Ringtone Maker”. Step 3: Tap on the Local Music or the Device Music to choose the song for conversion. Step 4: It will play the song. Click on “Set to Start” and “Set to Finish” buttons or use the the light-grey area to determine the ringtone. Step 5: Now, save the custom ringtone to PC directly to your iPhone. The RingtoneCutter Online is also one of the popular and free online iPhone tone converter. It is different from other ringtone converters. This website helps in converting the audio files into the ringtones without any additional features. For uploading the files, one can click on the ‘Upload Files’ button. 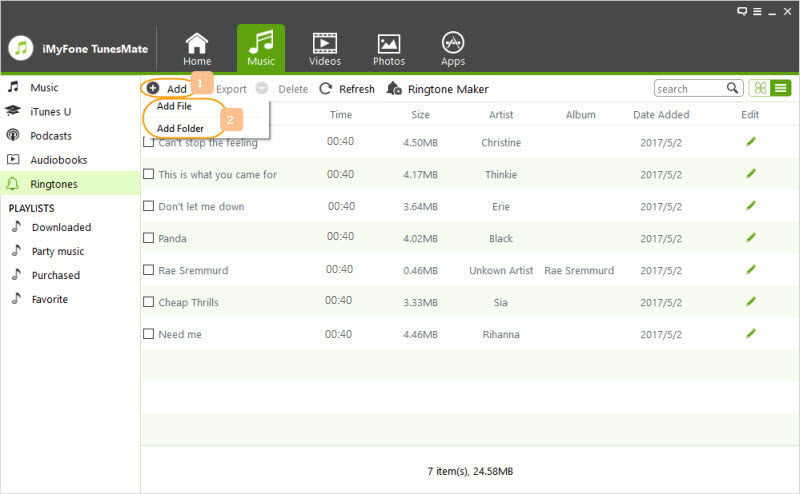 Users can choose up to 20 audio files. It requires fast internet connection when you upload the songs to computer. It only can be used to create ringtones without any other useful features. It doesn’t support to update songs from iPhone to this site and make ringtones. You can’t save the ringtones directly to your iPhone. This ringtone maker helps in making free ringtones from any of your favorite songs. One can directly upload the songs from PC or Mac. 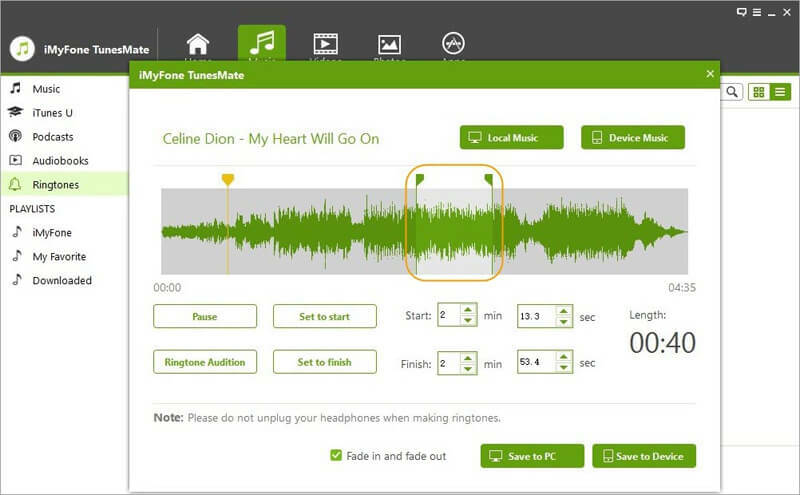 It helps the users to make the personalized ringtone by using the green tabs to decide the start and finish time. It may take much time when you try to figure out how to use for the first time. You can’t make ringtone from your iPhone songs. After making the tones, you can use it to save the tone to your iPhone directly. The Audiko is the best website ringtone maker that helps the user to convert the song to ringtone iPhone. One can create their own ringtones or have an added advantage of downloading other people’s creation too. There are many iPhone ringtones created on this platform. 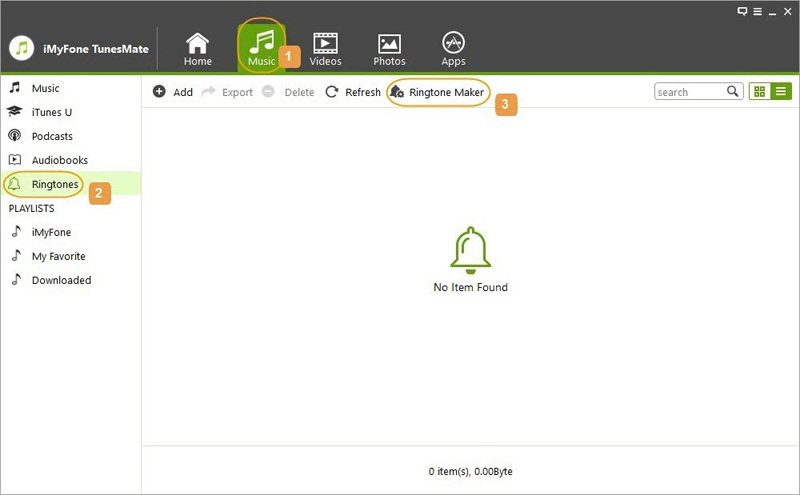 There is a possibility that the user will find the specific ringtone. 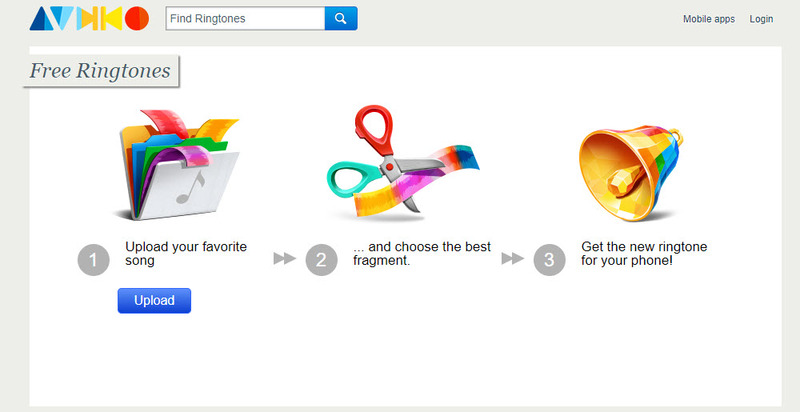 Users can edit the ringtones according to their preference and save on their PC/Mac device. You must create an account to customize tones. Only the songs on computer can be used to make ringtones, which doesn’t include songs on iPhone. You need to use iPhone Transfer Tool to transfer the custom ringtones to iPhone then. If you use the online ringtone converter to make ringtones, or when you download free tones from legal websites, you will need to transfer the ringtones to your iPhone. If you use old version of iTunes, you can use the sync feature to import them to iPhone. But note that, the existing files in iPhone will be erased as well. Since Apple has removed the “Tones” tab from the latest iTunes, you can’t sync with iTunes. Transfer (purchased & non-purchased) tones to iPhone from computer/iTunes without data loss. Extract ringtones from iPhone and share with your friend’s device. Step 1: Connect iPhone to computer and launch TunesMate. Step 2: If you want to sync iTunes tones to iPhone, go to “Transfer iTunes Media to iDevice”, check Ringtones and let it transfer. If you want to transfer ringtones from computer local folder, go to “Music > Ringtones”. Step 3: Click “Add > Add File” and select the music. Then let it transfer.